We knew we would come up against a much stronger Napoli side when we travelled to Italy for the second leg. 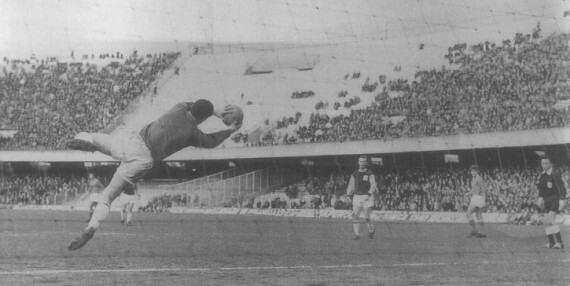 Our comfortable 309 victory at the Turf in the first leg had ensured that, as had the comments from Argentinean star Omar Sivori who publicly slated his manager Bruno Pesaola for fielding a weakened team. Manager Pesaola had suggested otherwise and reacting to this outburst from Sivori, which he made via their local newspaper. He fined him £570, although needless to say did not leave him out of the team for the second leg. 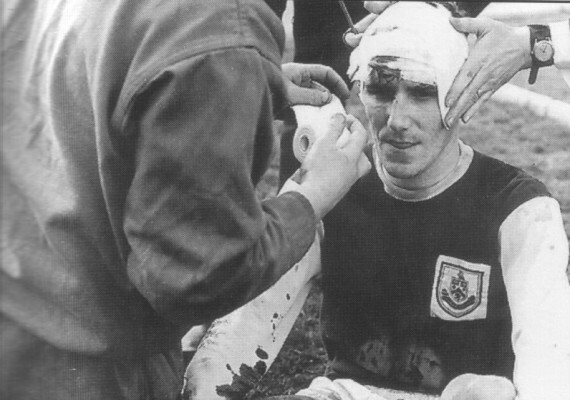 Burnley received a blow when right back John Angus had to pull out with injury just five minutes before the team left Turf Moor by coach for Manchester Airport. He’d missed the previous two league games with a groin strain but had come through a reserve game without problem. However, just five minutes before boarding the coach he admitted all was not right and he was left behind. 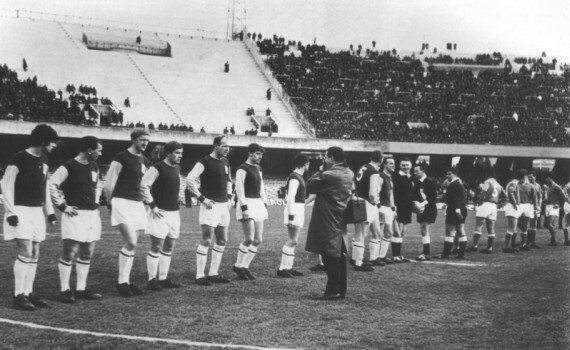 Keith McNee warned that we faced one of the most fanatical crowds in world football at the San Paolo Stadium and it was thought that there would not be many from Burnley able to offer their support. Our research suggests only four Burnley supporters made it to Southern Italy. Roy Kilby and Brian Wren opted to fly whereas 18-year-old Malcolm Moss and his travel companion 23-year-old Les Hurrell took a cheap option of ferries and overnight trains. Sadly only Malcolm remains to tell the story. Roy, dad of current vice-chairman Barry, passed away some years ago, Brian left us in the late 90s and Les died in the summer of 2003 after a fight against cancer. In the end there were two stories to tell – one of a game that ended goalless and saw Burnley go through, and one of the after match incidents that are still spoken about over half a century later. On to the game itself and I think it is fair to say that on that February afternoon in 1967 we came under enormous pressure almost from the start of the game. Three goals in front from the first leg we had learned our lessons from six years earlier and were not ready for an expansive attacking game of football. We defended in depth and even employed Les Latcham as a man for man marker on their danger man Sivori. Brian O’Neil and Gordon Harris were asked to work as cover defenders and only Willie Morgan, Ralph Coates and Andy Lochhead were given any licence to attack. It worked to an extent. It certainly frustrated Napoli, but even so it still needed one of the most inspired ninety minutes of goalkeeping to keep them out. Harry Thomson was simply in brilliant form and turned in a performance that was ranked alongside the fabulous showing from Adam Blacklaw in Paris in the European Cup tie against Reims. Things went reasonably well in the first half but just before half time Brian Miller was wrongly adjudged to have handled the ball and the Hungarian referee awarded Napoli a penalty. Thomson though was equal to Altafini’s spot kick, diving to his right to push it onto the post. It led to an incredible second half performance from the Scot with his best save of all coming midway through the half, a simply brilliant mid-air stop from Micelli’s pile driver from the edge of the box. The Daily Express said of his performance: “Harry Thomson was a God in a green jersey under a cloudy Mediterranean sky. Burnley’s little Scot had one of those goalkeeping hours when the impossible seems to have happened not once but frequently. Poor Latcham was in the wars towards the end, left with blood streaming down his face after a clash of heads with Altafini. It was an accident, and with no subs back then both were patched up and carried on until the end. The Italians were getting more and more frustrated and it was no accident when Sivori elbowed Merrington with four minutes to go. That went unpunished. He then turned his attentions to the already injured Latcham, and got away with it again. 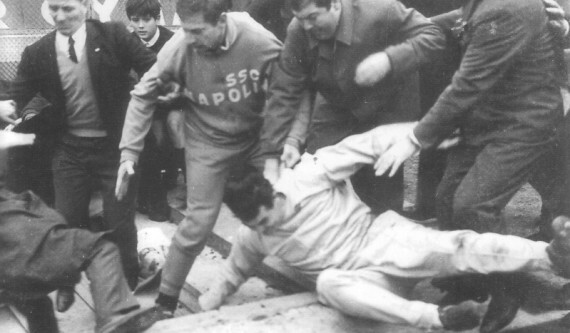 The Italan side had lost it completely by now, and as they did the big crowd were becoming more and more hostile. The end finally came, and I suppose we could call it the end, the moment the final whistle went to signal a safe passage into the next round. Did I dare to say safe? In football terms it was but hero Thomson, who had apparently indicated to one of their players that we were three goals to the good was to be the centre of a major incident. He went to shake hands with Orlando but the Napoli player spat in his face. Harry was not the quietest, calmest of people and he was having none of it from Orlando. He didn’t reckon on members of the stadium staff ganging up on him, but thankfully for him Adam Blacklaw, who had been on the touchline, came to his rescue. Adam was attacked by those staff and was finally rescued by the police who arrested him for his own safety. The rest of the players and staff eventually made it back to the dressing room and what they thought was a safe place, but the police were fighting a battle to prevent the home fans from breaking in. Fires had been started in the stadium and the only good news at this stage was that our few supporters had managed to get out of the place safely, just about. Eventually some calm was restored, Adam was returned to his team mates and all that was needed now was to get the party safely out of the San Paolo. They all finally boarded the coach from within the stadium and an armoured lorry, nine jeep loads of militia and a dozen police motor cyclists formed a protective convoy as they made the five mile journey back to Capodochina Airport. Before they left manager Harry Potts went back into the stadium and walked in the dry moat to the far side looking for the English press. There were six of them, including Keith McNee of the Burnley Express and the Burnley Star’s Granville Shackleton. He couldn’t find them but they, having been trapped in the press box, had also been taken into custody. Finally they were returned to the airport in two taxis, receiving protection from militia carrying machine guns. On his return home Granville headlined his report in the following evening’s edition “See Naples and Die, and Burnley almost did”, which I’m sure he wouldn’t have minded me using. Thankfully no one did and everyone returned to tell the tale and look forward to what surely would be a quieter quarter final. SSC Napoli: Bandoni, Nasdin, Micelli, Ronzon, Gisardo, Bianchi, Orlando, Juliano, Altafini, Sivori, Braca. Burnley: Harry Thomson, Fred Smith, Sammy Todd, Brian O’Neil, Brian Miller, Dave Merrington, Willie Morgan, Andy Lochhead, Ralph Coates, Gordon Harris, Les Latcham.